Christmas has been on our minds at CHG this past week. I know, I know. It’s only September. But before you start screaming “It’s not halloween yet!” or “Respect the bird! !”, I want to remind you of the Great Hatchimals Debacle of 2016. Remember those giant speckled eggs that every kid wanted, but were IMPOSSIBLE to get your hands on come November? That is, unless you were willing to pay upwards of $100 (or more!) to someone who had the foresight to buy extra with the intention of gouging such desperate parents. And that price tag ticked up every minute closer to December 25. Every year there’s at least one item on every kid’s wish list that proves to be hard to find. Over the past couple of weeks, retailers and forecasters have published their lists of what they expect to be the top toys of 2018’s holiday season. 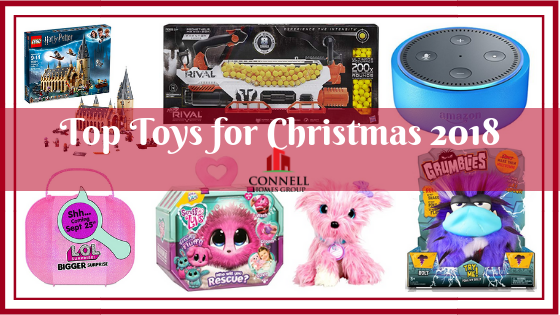 With the closing of Toys R Us earlier this year, it is expected that Amazon and big box retailers such as Target and Walmart will be the go-to shopping location for toys this holiday season. While it is expected that their inventory levels should take this into consideration, it’s probably not wise to wait until Black Friday to start your shopping. Besides, who REALLY wants to stand in line on Thanksgiving to fight over a $15 toy?? Please note, we are not compensated for suggesting the links below. But who doesn’t love Amazon?? The $400 price tag on Hogwarts is probably too much for most parents to swallow, so experts are expecting the Great Hall kit to be the popular compromise. Rated for ages 9+, this is a great hands-on item for kids who are becoming harder to shop for, with wish lists heavy on the electronic and video game category. LOL Surprise! Dolls have been on the scene since 2017 and started as plastic balls containing a Surprise! tiny doll and their accessories. They have since expanded to include Little Sisters and Pets, in varying size packages and accessories. Last year’s holiday gift was the Big Surprise Ball which retailed at $70 and contained 50 pieces. This year, retailers are offering the BIGGER Surprise Box with 60 pieces, including Limited Edition LOL Surprise Dolls, Pet, and Lil Sister. The price tag has increased from last year, and is currently $100. Set to release on September 25, retailers are already selling out on preorders. The new “mystery” toy of 2018 are Scruff-A-Luvs. Choice of pink or blue, the surprise animal, “unloved and abandoned”, arrives a matted ball of fur, which your child must wash, blow dry, and brush to turn into a stuffed pet–puppy, kitten, or bunny. Not just another gross gimmick, Scruff-a-Luvs is a proud supporter of The American Society for the Prevention of Cruelty to Animals. By adopting a Scruff-a-Luv, you are also donating to the ASPCA to provide effective means for the prevention of cruelty to animals throughout the United States. This interactive baby T-Rex loves his caveman cookies, but broccoli–not so much. An adorable little creature that hops and begs for his treats, which he will either eat or spit out. Kind of like a puppy, but without the mess and vet visits. Perfect for kids ages 4+, when they wave or feed him his treas, baby dino responds with 35+ sound-and-motion combinations. Attention girls of the 1980’s! Toy-makers have been feeding on the nostalgia-factor for several seasons now, and 2018 is no exception. Polly Pocket is making a return after a several year hiatus. The newly-designed powder compact style playsets for tiny dolls include beach, dance party, and pet park sets, among others. Bound to be a hit with the 5-10 year old crowd, just keep the pieces away from your Dyson. The tagline is “Don’t make them meltdown!” These angry-looking interactive creatures are said to be the cause of disasters such as earthquakes and volcano eruptions. They thrive on bad behavior, so the more you mess with them, they grumble and groan. The goal is to get them to full meltdown mode! Behold the badboy of all Nerf guns, the Rival Prometheus MXVIII-20K blaster. It fires 200 rounds at a rate of 8-per-second, at a velocity of 100-feet-per-second. Not for the weak, this item has a shipping weight of 10.5 pounds, so have your kids (or Dad, we don’t judge!) start lifting weights now! 2017 brought us Fingerlings, 2018 brings Pomsies. These are interactive pets with slap-bracelet tails. Pomsies will tell you when they feel tired, cold or hungry with light up eyes, purring and other sounds. These fuzzy critters also have a special freeze dance mode your kids can play with their friends! Speaking of Fingerlings, the brand has added a menagerie of animals to the line in the past year, including sloths, unicorns, and pandas. But the anticipated big seller for this holiday season is the oversized, stuffed HUGS monkey. Their long arms are perfect for big hugs and these cuddle monkeys never want to let you go! They will kiss and laugh, but similar to a real monkey, they are not known for having the best manners. They also burp and toot. And the winner of this year’s “Grossest” category, Don’t Step In It. Noted for its “blindfolded, poop-dodging fun”, this game touts the winner as the person who steps in the least piles of poop. Comes with a playmat, blindfold, mold, and play-doh-like compound for creating your own poo piles. STEM and STEAM concepts continue to evolve, and every year there are some fantastic toys that add learning into the fun. Best Toy of the Year 2015, the Osmo kit continues to be a top-placed tech toy. The iPad compatible (sorry, no other tablets work!) learning tool takes concepts of math, spelling, and problem solving, and makes them fun. Many schools are adding the Osmo kits into their curriculums, which helps to extend the learning from classroom to home. Genius Kit, great for ages 5 to 12, comes with the Osmo iPad Base (stand & reflector), game playing pieces (including upper and lower case words tiles) and stackable storage containers. Alexa and the Echo devices have been best-sellers for several holiday seasons now. This year, Amazon came out with a kid-friendly version of the Echo Dot device. The included 1 year of FreeTime Unlimited gives your kids access to hundreds of hours of fun and educational content, including ad-free radio stations and playlists, Audible books, and a growing list of premium kids skills. Easy-to-use parental controls in the online Amazon Parent Dashboard let you set daily time limits, review activity, or pause Alexa on the device. You can drop-in call from other Alexa-friendly devices to call the kids down for dinner, and add approved family and friends so they can message and call Grandma. Alexa will also automatically filter explicit songs from Amazon Music or Spotify, so Junior isn’t picking up phrases that will land him in the Principal’s office. Comes with a kid-friendly case in red, blue, or green.